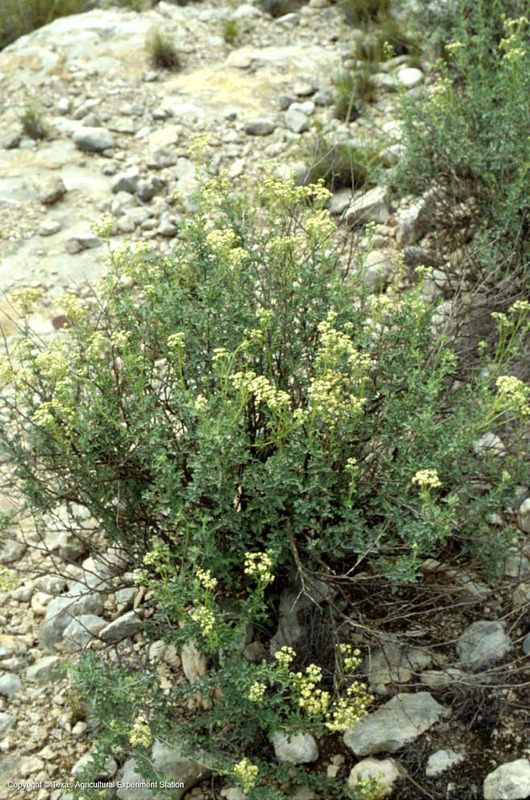 Mariola is a pretty name for a delicate-looking, exceedingly tough plant which makes its home in the Trans-Pecos deserts, Edwards Plateau and in the Rio Grande Plains, north to Arizona and New Mexico and south into Mexico. Its intricately-branched stems and tiny, lobed, aromatic leaves have a covering of silvery-white hairs and bear clusters of white flowers throughout the summer. It hybridizes readily with P. argentatum, and the two species form hybrid swarms throughout much of their range. Like P. argentatum, it also contains rubber and has been used somewhat commercially. Because of its extreme drought tolerance, and full sun requirement, mariola can be used for erosion control on exposed slopes and highway plantings. Its diminutive shape allows it to fill small spaces as a xeriscape accent.